© Ernest Metzger. This page is part of the twin portals Roman Law Resources and Informationsquellen zum römischen Recht, hosted by the University of Glasgow School of Law, SCOTLAND. A. Watson (ed. 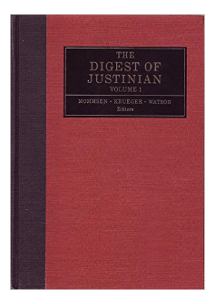 ), The Digest of Justinian [with Latin text edd. T. Mommsen and P. Krüger] (Philadelphia, PA: University of Pennsylvania Press, 1985), 4 vols. ISBN 0-8122-7945-X. A. Watson (ed. ), The Digest of Justinian [revised English-language edition] (Philadelphia, PA: University of Pennsylvania Press, 1998), 2 vols. ISBN 0-8122-1636-9. A small number of the corrections listed here have been noted in the second edition; these corrections are noted on these pages. Because in many instances they offer translations that differ from those given in the second edition, they will continue to appear here. — Proposed translations to replace those of the Pennsylvania Digest. — Comments on those translations. — Cross-references to other Digest texts, where appropriate. Last updated 7 July 2016. RSS Feed · Facebook · Copyright © 2016 by Ernest Metzger. All rights reserved.